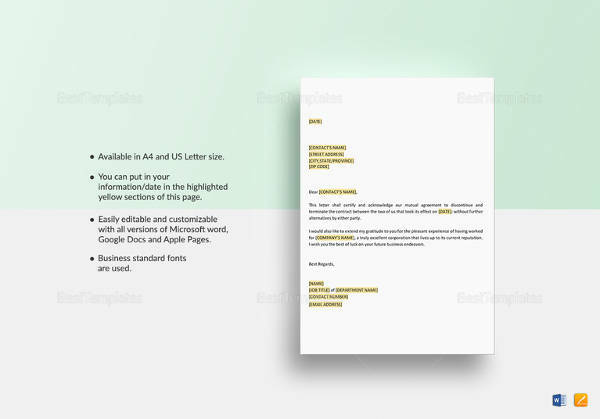 Service providing companies who work on contractual basis often need to furnish contract termination letters to the clients and the customers who have breached the contracts. 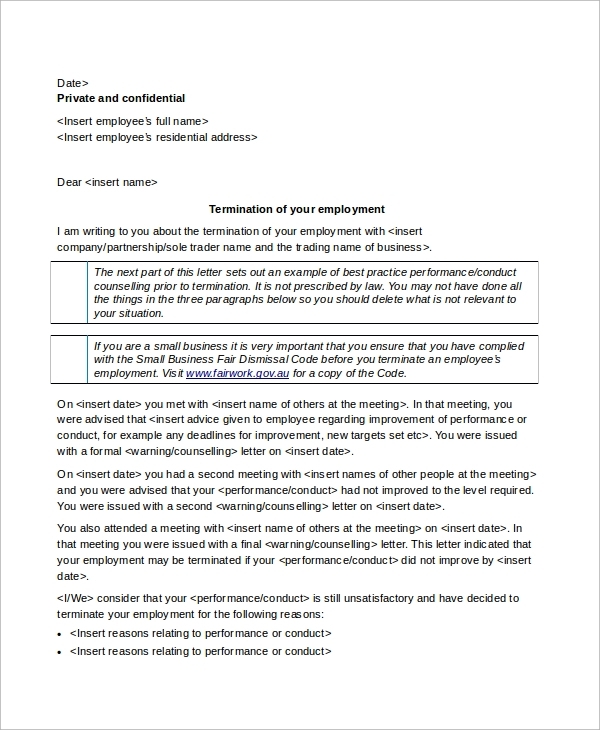 The following contract termination letter samples also contain Employee Termination Letter Samples which general companies prefer to terminate its employee’s contract due to his continuous bad performance or bad conduct. They are completely professional in tone with no strict words but only reasons, deadline and further course of actions. 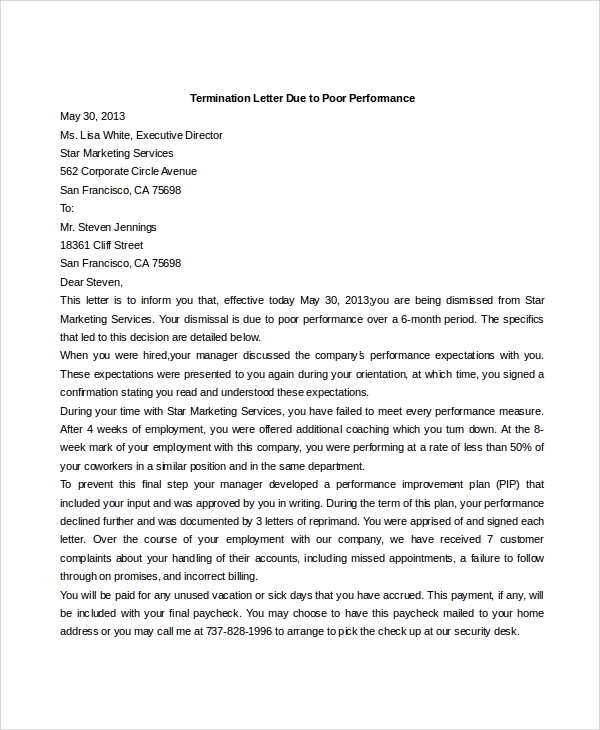 This is a formal service contract termination letter from a client to a service company. It should clearly state from when the contract will be termination and it should politely state the reason for such decision. 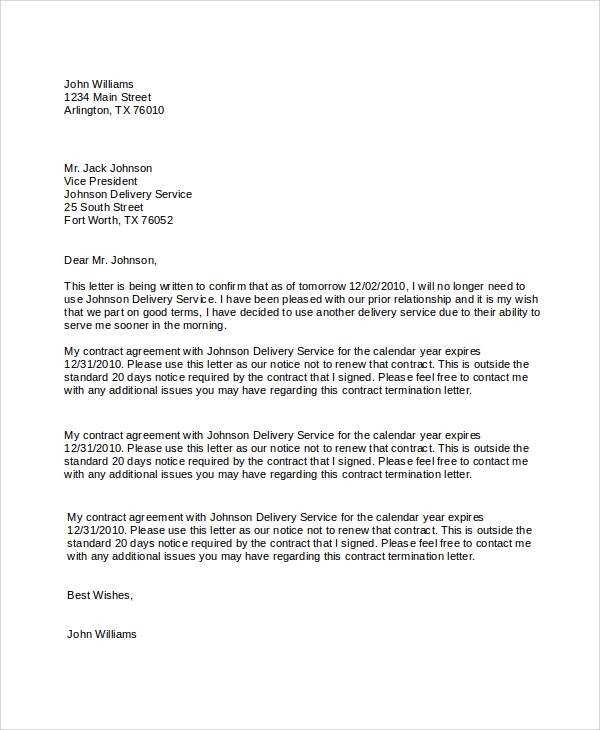 It must state the contract details such as when it is getting terminated naturally, the notice period and it must have a provision stating that the company can contact him to resolve any issue regarding the termination. 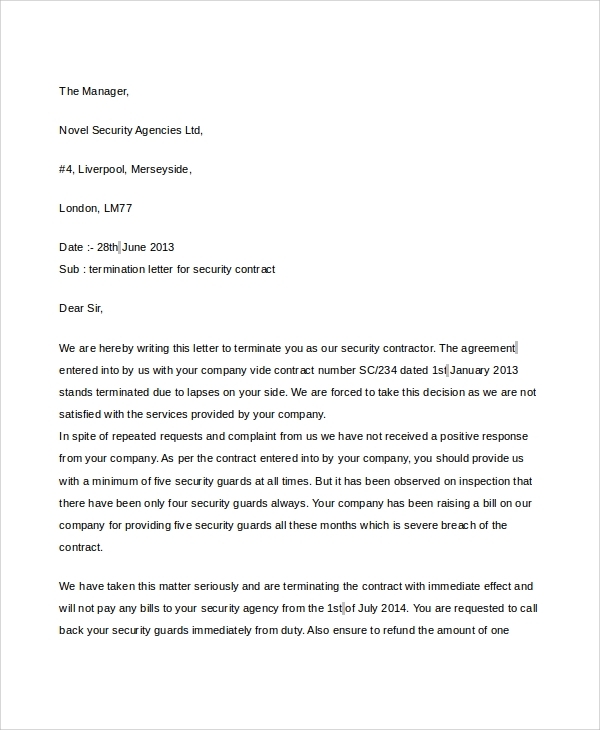 This is a formal letter from security contract to the customers who hired them on a contractual basis for providing security related services. It must state clearly the decision and the reason for the decision to termination of the contract. It must also state the future plan of action and it can be in polite tone or strict tone depending on the reason and attitude of the customer. 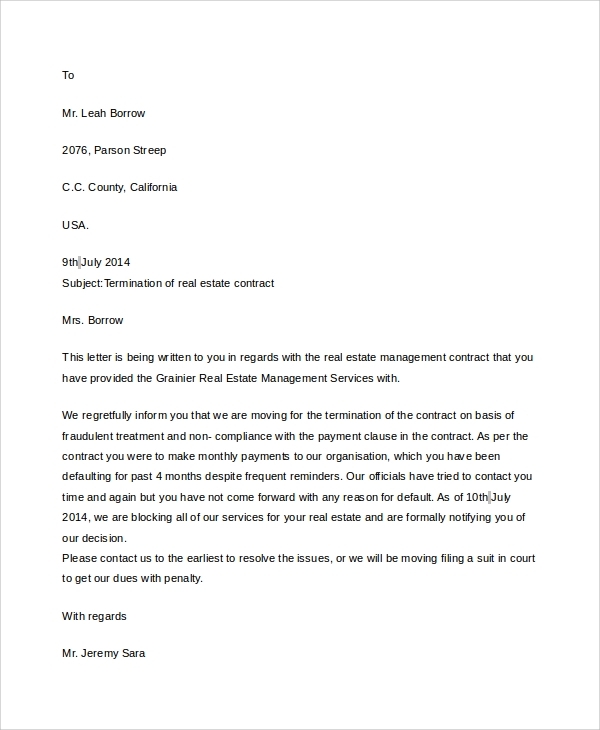 This is formal contract termination letter issued by any real estate company to the customers who hired them for real estate management. 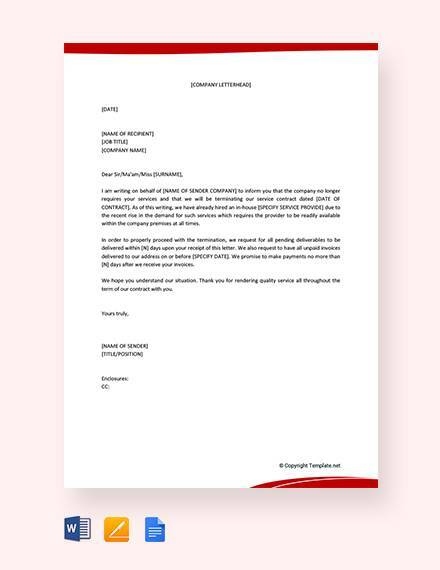 The letter must clearly state the reasons for such decisions and how the company approached him several times without any reply. It must also declare the financial dues that the person owes to the company and that they are moving to the court to resolve the issue. 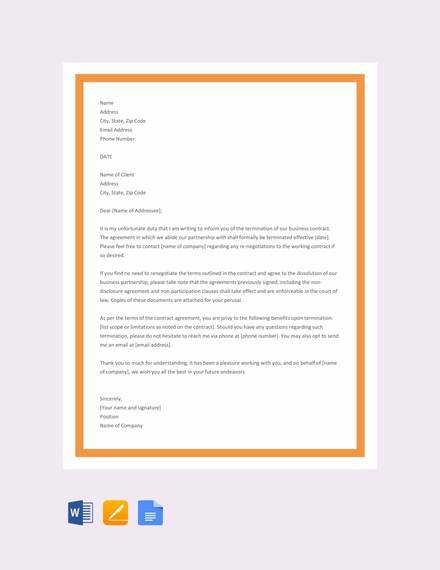 This is a perfect and professional contract termination letter from a vendor to its customer who hired them for their services. The letter must state clearly and vividly state why they have decided to terminate the contract for the services and what they are planning to do for receiving any dues. It must state how the customer has been reluctant to reply to the many approaches applied by the company. The targeted audiences in the contract termination letters are always the guilty party who have breached the contract. It acts as a final warning with provision for resolving the issues or strictly a termination legal notice and things are going to get legally operated now. It could be the clients and customers or even the service providing companies. 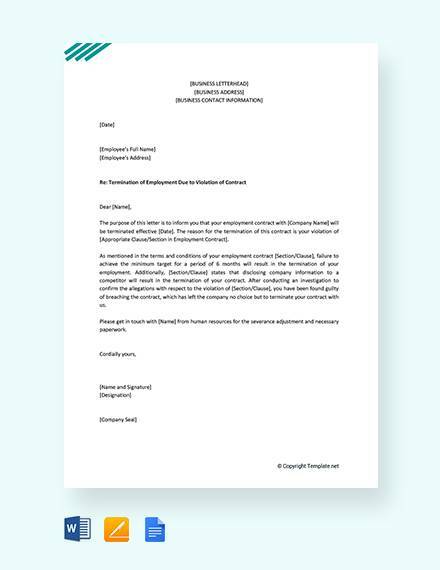 The benefits of such contract termination letters is that the company now owes no service to its guilty client or customers and these letters are a legal proof of the same. They can officially stop working for them and move on to the next project and apply a legal course of action, if needed. The customer can never claim in future or complain about the pausing of work. 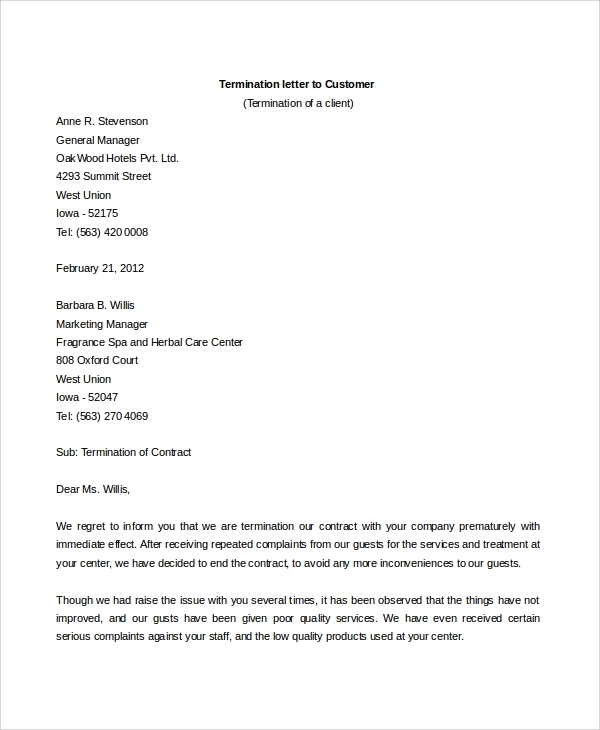 Generally, before actual termination, the company provides the service for a Termination Notice period in which the clients can resolve the problem or prepare for legal consequences. 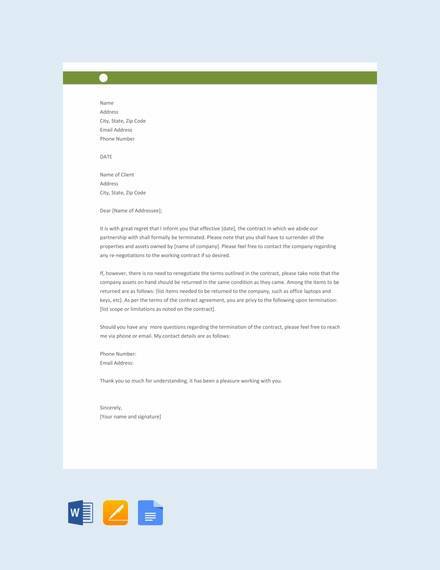 The above Lease Termination Letter Samples have clear layouts for pointing out the reasons for termination, a proper deadline for response from the guilty party and resolving issues and what could be the next plan of action. They are direct and professional with impacting words and sentences. They are applicable on any company regardless of what the contract breach is all about.